Knight and Jones both make 63 as England set up 142 run win over New Zealand. England Women followed up victory over New Zealand in the final of the T20 tri-series with another win in the first ODI at Headingley. Batting first England got off to a strong start, and despite a mid-innings wobble they went on to score a very competitive 290/5 with both Amy Jones and Heather Knight scoring 63. It was far too many for New Zealand who were bowled out for 148 as England won by 142 runs. The game began with Jones and Tammy Beaumont putting 111 for the first wicket as they took a real liking to the New Zealand seamers in the early exchanges. Although the boundaries had been flowing from the quicker bowlers it was a seamer that got the first breakthrough. Lea Tahuhu sent down a wider ball that Beaumont chased and she was gone edging behind for 40. Two further wickets followed as England falled to take full advantage of such a strong start with Amelia Kerr dismissing Sarah Taylor and Amy Jones in the space of 19 runs. England could well have fallen apart at that point, with Kerr and Leigh Kasperek keeping things tight. 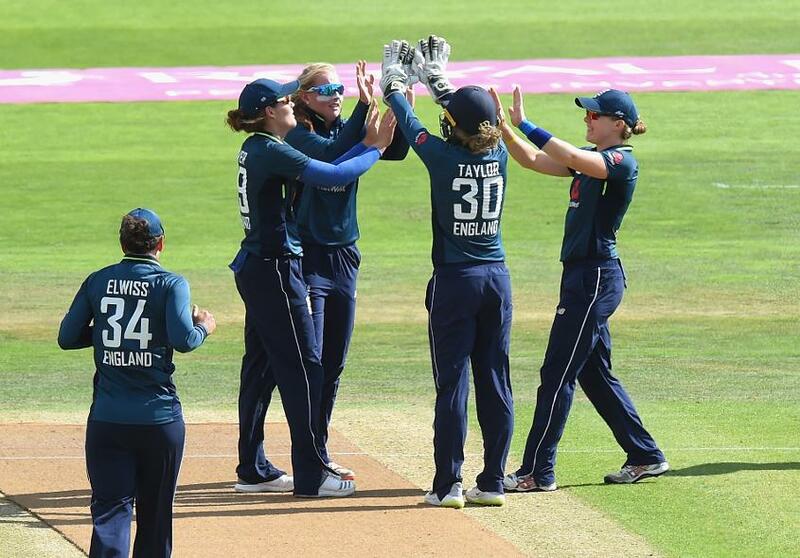 However, England’s experience middle order did not allow the cluster of wickets to affect them as Knight and Nat Sciver put on 67 for the fourth wicket to take the England score past 200. The partnership was broken when Tahuhu trapped Sciver LBW for 37. Knight was joined at the crease by Katherine Brunt who continued her fine form with the bat with a busy 30 from 31 balls. The innings was full of good running as Brunt managed just one boundary in her stay while going at a very good strike rate. The decision to have her come into bat ahead of Lauren Winfield was a good one. As was the case in the recently concluded T20 tri-series New Zealand got off to a good start but they fell away badly once the experienced Susie Bates (28) and Sophie Devine (33) were dismissed. They were gone within six balls of each other having put on 70 for the first wicket. Those two wickets saw another couple follow straight away as Katey Martin (1) and Amy Satterthwaite (2) were gone with Sciver and Georgia Elwiss with the dismissals as New Zealand stumbled to 75/4. The next highest scorer for New Zealand after the openers was the 21 made by Maddy Green who tried in vain to hold things together. While she was hanging around she wasn’t keeping up with the rate with her innings lasting 35 balls before she was dismissed by Sophie Ecclestone. With the rate rising and wickets falling England did not let up was Laura Marsh made her way through the New Zealand tail, picking up 3/24 in the process. The last wicket of the New Zealand innings, that of Holly Huddleston, fell to Katie George as the 19-year-old continues to impress in her first home summer, claiming a wicket on ODI debut.